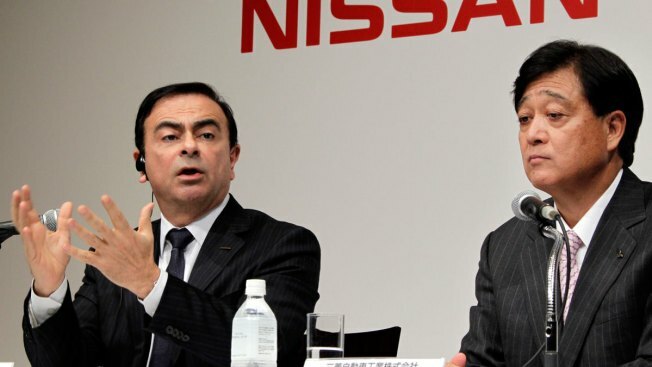 In this this Dec. 14, 2010 file photo, Nissan Motor Co. President and CEO Carlos Ghosn, left, speaks as then Mitsubishi Motors Corp. President Osamu Masuko looks on during their joint press conference in Tokyo. Scandal-plagued Mitsubishi Motors Corp. may have a suitor, Nissan Motor Co., headed by auto-industry turnaround guru Carlos Ghosn. Both companies acknowledged Thursday, May 12, 2016, they were in talks on various issues, including a possible partnership involving stake ownership. Scandal-plagued Mitsubishi Motors Corp. may have a suitor, Nissan Motor Co., headed by auto-industry turnaround guru Carlos Ghosn. Both companies acknowledged Thursday they were in talks on various issues, including a possible partnership involving stake ownership. Nothing has been decided, and announcements will come when they are ready, the companies said in separate statements. Japanese media reports said Nissan would take a 30 percent stake in Mitsubishi Motors. The reports did not cite sources, which is customary here. The companies will hold board meetings Thursday, according to the reports. Mitsubishi has been rocked by a scandal over cheating on mileage tests to inflate mileage for minicar models. Nissan has a major partnership with Renault SA of France, which sent in Ghosn in 1999 to engineer its revival from near bankruptcy.